Do you think you know Old Key West? 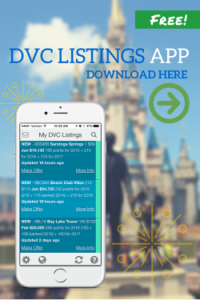 It has been around for a while; after all, it was the first Disney Vacation Club property constructed and is still popular for its spacious rooms and lush landscapes, as well some unique amenities, but this old resort is about to learn some new tricks. Like most things Disney, Old Key West has a story. 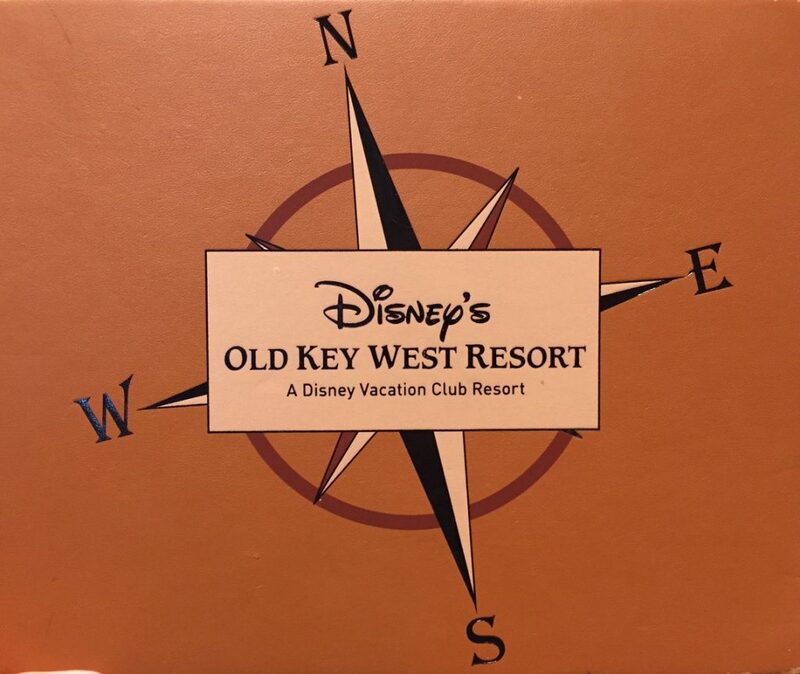 It opened in 1991 as the Disney Vacation Club Resort and was renamed Old Key West in 1996. 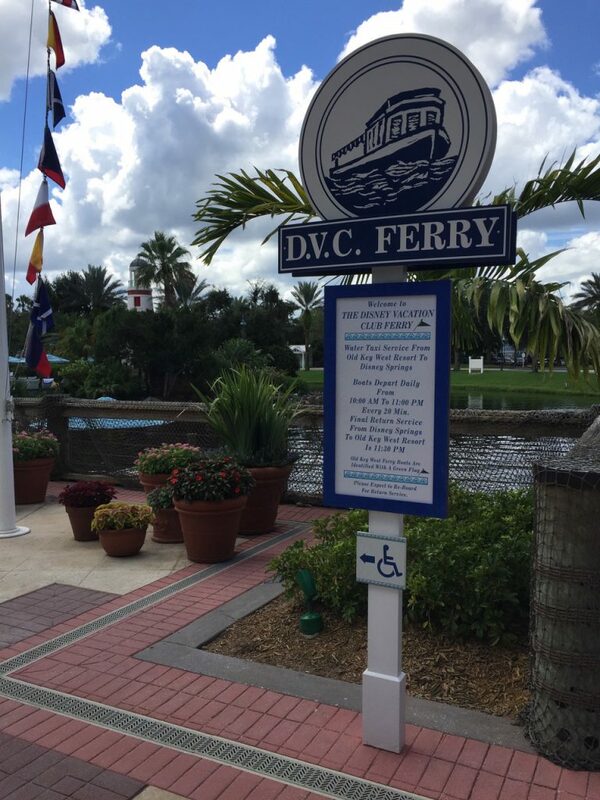 If you visit the property, you will notice signs for Conch Flats, which is the legendary area in which the resort was built. 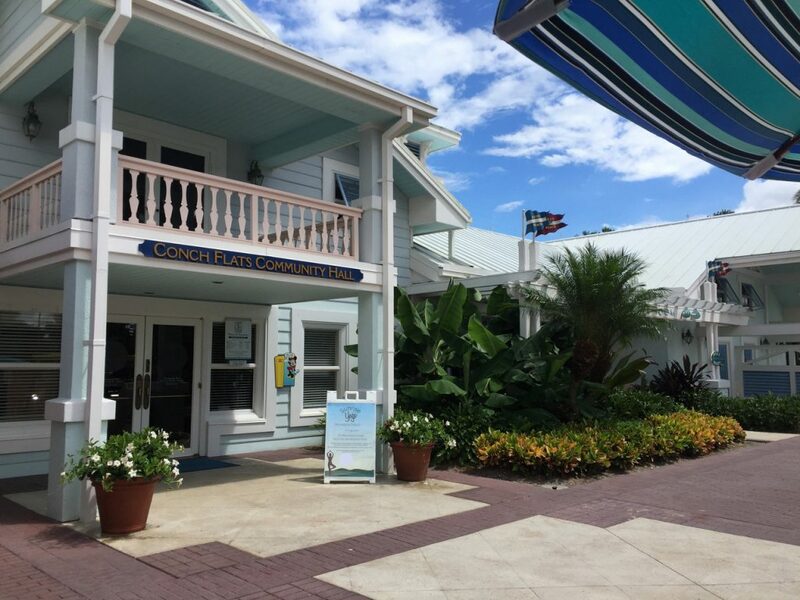 Visitors are invited to learn more of the resort’s lore in an hour-long walking tour that leaves from the lobby on Wednesday and Saturday mornings at 10:00, which is a fun way to see Old Key West’s past mingle with its present. 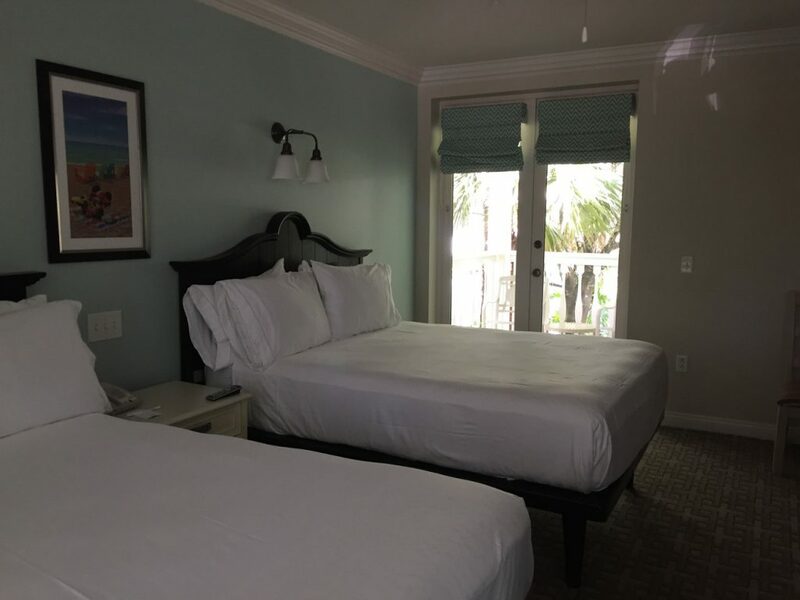 As of 2018, the rooms at Old Key West have seen some major renovations and improvements. These will continue into the spring of 2019 with each building being closed for four to six weeks throughout the year as the rooms are modernized. 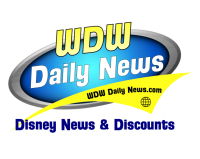 These upgrades including everything from new tiles and bathroom fixtures, redesigned kitchens, comfy mattresses, plush carpets, to a touch of Disney magic. 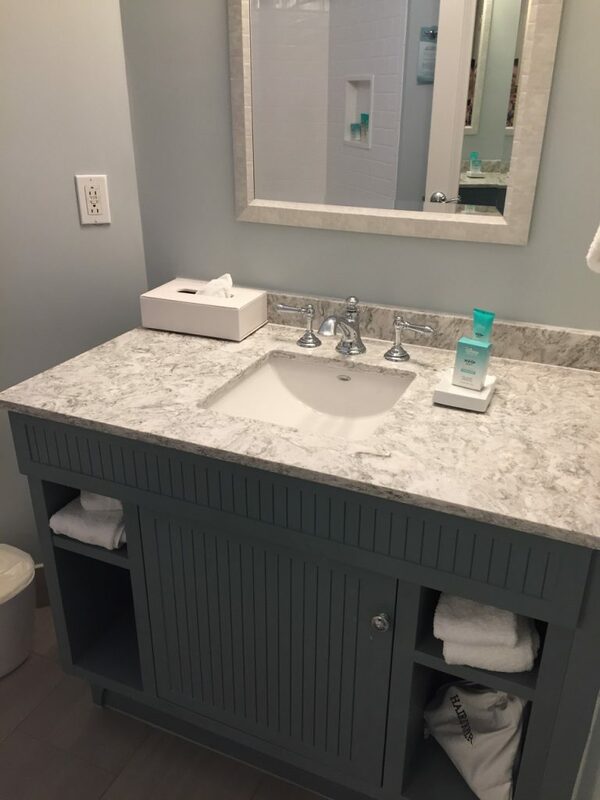 In addition to updated artwork and furnishings, the refurbished bathrooms will no longer have the 1950s style pastel tiles and dated sinks; these have been replaced with iridescent, modern tiling, stylish metal faucets, and spa-worthy shower heads. 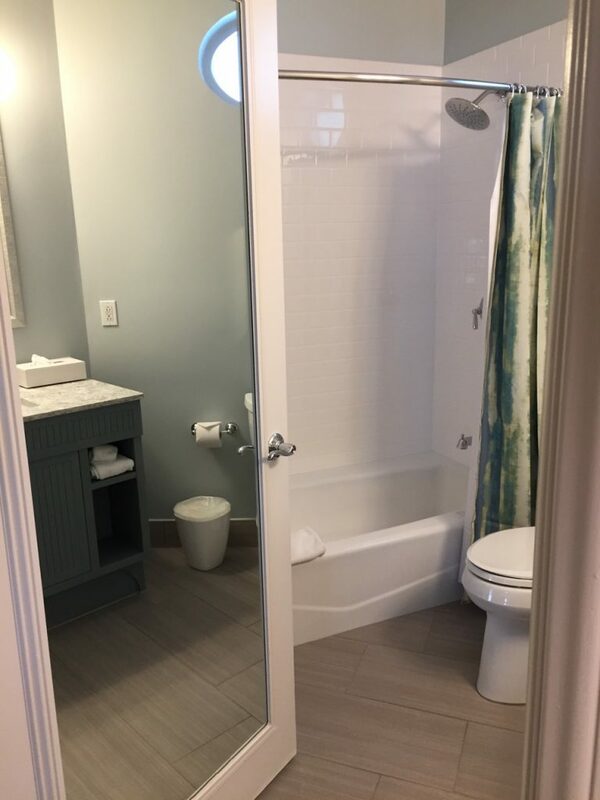 Larger rooms have glass-paneled showers, and all have comfy new towels and bedding. 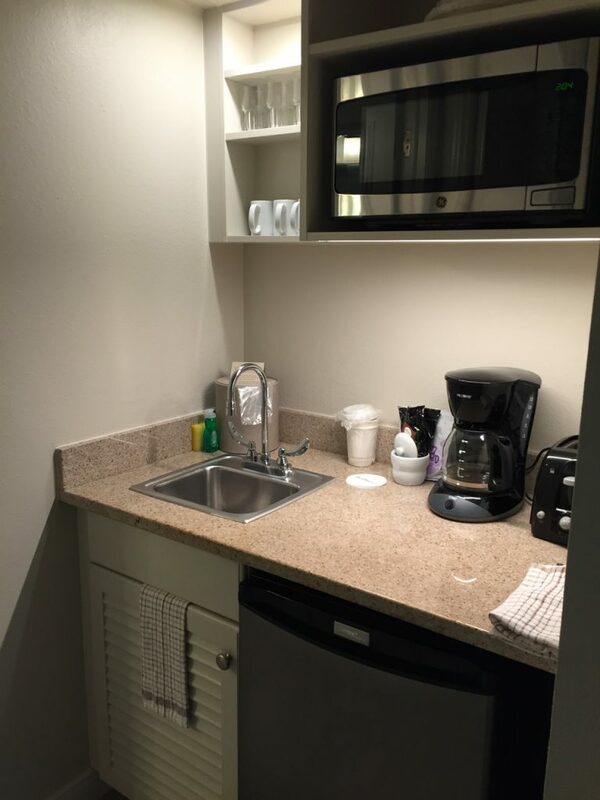 The kitchens are better organized, too, with remodeled countertops and cabinets that allow quicker access to necessities. The cast members are obviously proud of these changes, and several members of the housekeeping staff drove me to remodeled studio rooms for these photos. 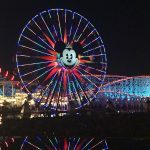 Service here is always magical, as one expects at Disney! Unfortunately, remodels take time. Although many of the outlying buildings are already updated, the Hospitality House area is not expected to be completed until late spring of 2019, but it will be worth the wait! 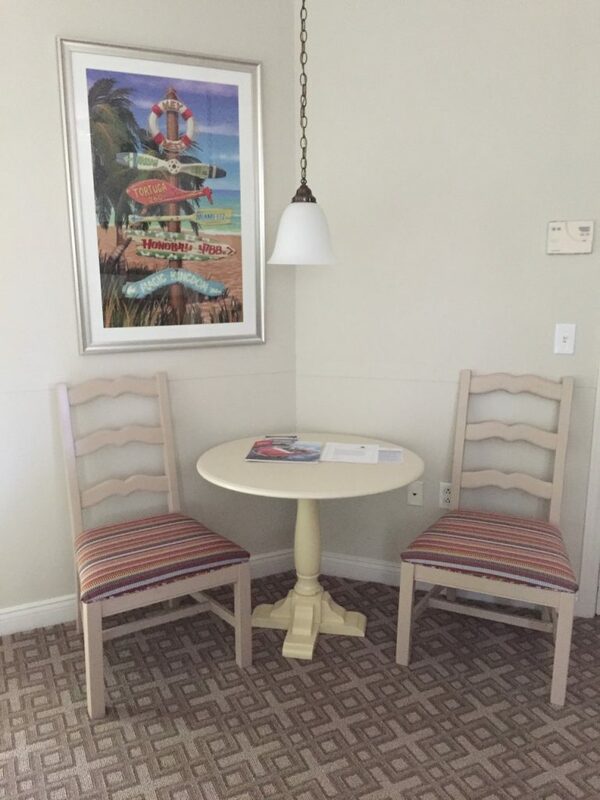 In addition to the room updates, Old Key West continues to wow guests with old favorites. 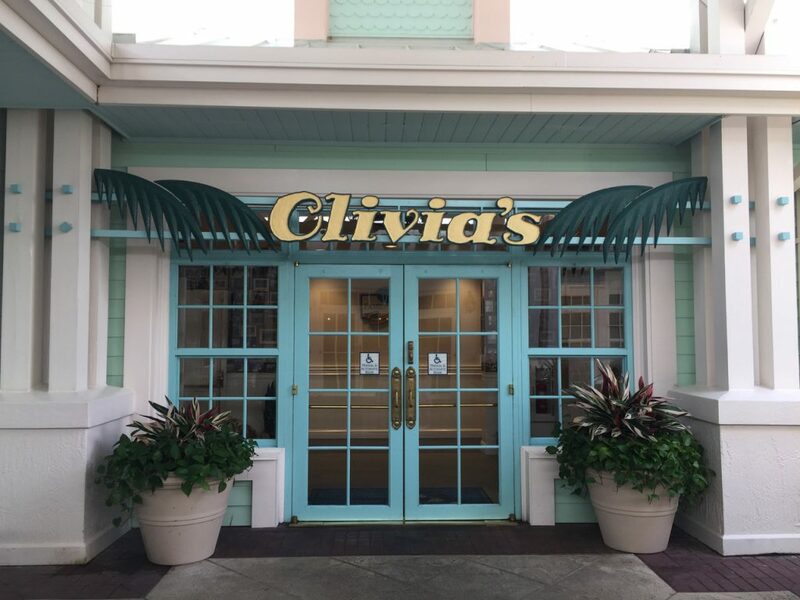 The famed table service restaurant Olivia’s offers home-style fare in a friendly atmosphere. This table-service restaurant is so popular that you should expect to wait at least thirty minutes in the evenings if you don’t have a reservation, but lunch hours are often less crowded. 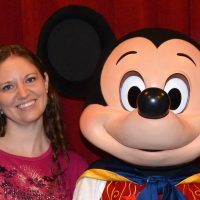 You may also want to share these meals if you have a smaller appetite because they are plentiful, even by Disney dining standards. Try to save room for some famous key lime pie, too, which is presented as a tart topped with colorful fruit sauces, or help your kids make their own sundae. 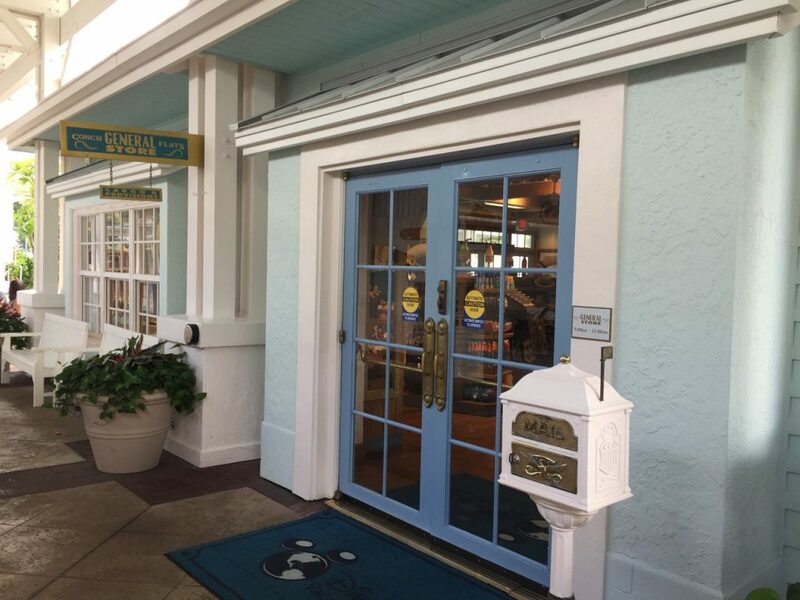 In the evening, stop by the Gurgling Suitcase for a sip of one of their signature drinks or a friendly chat with one of the experienced bartenders. My favorite concoction is the Sultry Seahorse, which is a rum-based tropical punch with pineapple and other fruit juices; it’s only available at Old Key West. 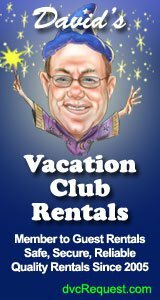 Also note that, like Olivia’s, the Gurgling Suitcase often offers food discounts for Disney Vacation Club members. While you’re in the Hospitality House area, check out the Community Hall. 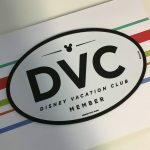 In the past, my family visited halls at five DVC resorts, and Old Key West is probably the friendliest – which is quite a compliment, considering they are all exceptional. The cast members here often remember my daughters from one trip to the next and have even greeted them by name. Visiting here truly feels like coming home and is a fun way to relax during a rainy evening. The main pool is one of the reasons we love Old Key West. It’s shallow throughout, which is inviting for kids, and the water slide is “just scary enough” without being terrifying for little ones. It’s clear that this area, with its sauna, hot tub, sandy play area, and signature lighthouse, was designed with a lot of thought for the families who would visit Old Key West at all stages of their lives. 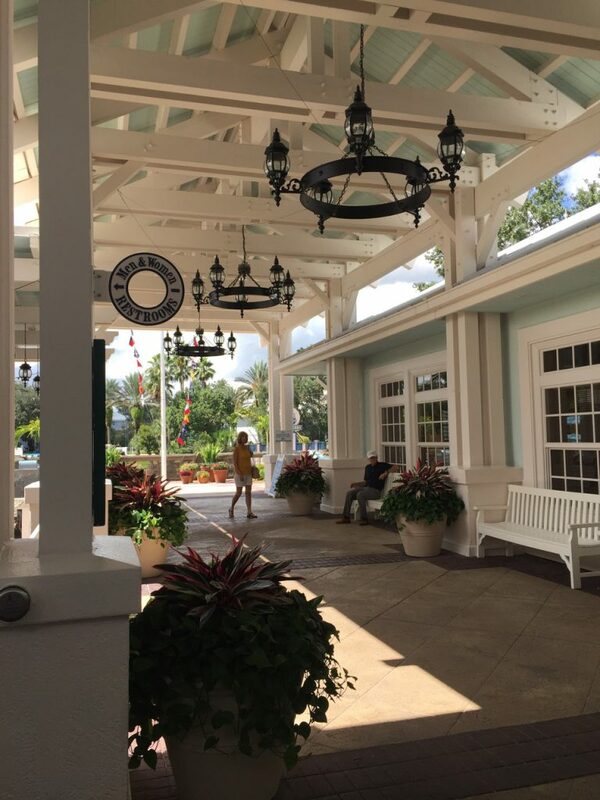 Adjacent to the Hospitality House is the dock, which offers visitors quick ferry rides to Disney Springs. These small boats run well into the night, giving guests a direct route to the exciting nightlife and restaurants just upstream with a dock adjacent to Jock Lindsey’s Hangar Bar. If you’re lucky, you might even catch a glimpse of some real wildlife on the way; we’ve seen deer and turkeys along the creek’s banks! Nature is never far away at Old Key West. Many of the buildings are adjacent to Disney’s Lake Buena Vista Golf Course, which offers 18 holes of PGA quality play lined with tropical vegetation. Even if golf is not your bag, you will appreciate the quiet landscaping of the greens and fairways that are visible from many rooms. 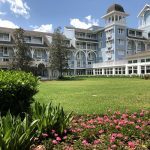 Golf carts are popular among resort guests, both on and off the course, and these make the resort feel more like an island community than a bustling tourist destination. 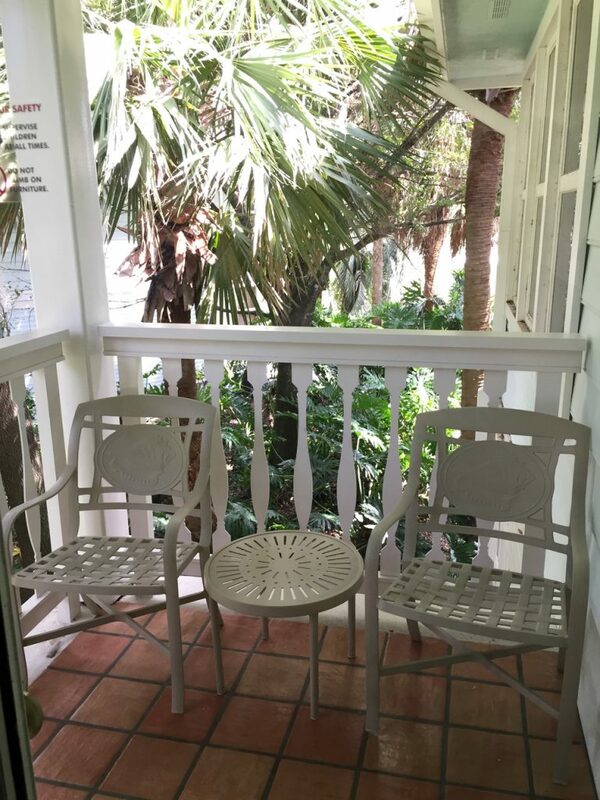 Community is what makes Old Key West feel like home, not just another hotel. 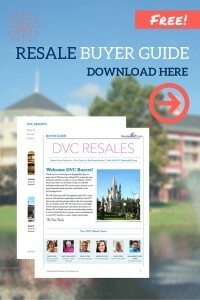 Do I recommend this as a Disney Vacation Club home resort? Yes! After the renovations? Absolutely! 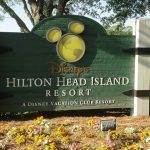 This was my first home resort, and it is still my favorite place to stay at Walt Disney World. 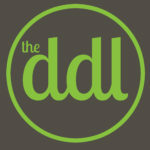 It has always felt welcoming and homelike, and its new improvements ensure that it will stay magical for years to come. Do you know what buildings have been completed?! Absolutely hate the new bathrooms! The old ones were so cute with the shiplap-type walls and the corner shelf. It felt like you were at the beach! The new vanity is sterile and unremarkable. Looks like any motel bathroom. Nothing special or “magical” about it. Wouldn’t even know you were at Disney. And the shower part of the bathroom only had two towel racks. This was building 28 in November. When we stayed in building 26 in August, it was the old style. Such an unpleasant surprise a few months later. I loved the rooms. We stayed in a 2 bedroom villa. I want to know what kind of matresses they used because I need one for home. I got home to my hard mattress and realized I missed the bed we slept on. Can someone tell me what they use?